As part of the Material World Summer School the Ark (Cultural Centre for Kids in Temple Bar in Dublin) is offerings “a fantastic opportunity to young people to learn fun new skills working creatively together looking at the earth, playing with natural fibres and making a magical large scale felt piece. They will be able to work sculpturally with the felts, to create rock formations, glaciers, animals, flowers, and creatures from their imagination. This truly is felting beyond the boundaries! Over four days from Tuesday 7 to Friday 10 July from 10am to 3pm each day, artist Brigid McClean will guide children aged 9-11 years through the process of creating their own handmade felt”. What a great Summer so far. Our Drop In sessions have concluded until September but have a look at the Drop In page for the list of exciting topics we will be covering over the next year. We are also expanding to include a Drop In day in Bray once a month. Sharon Wells will be co-ordinating the sessions which will take place upstairs in the Fabric Gallery Dates are yet to be confirmed. We are getting ready for the Féile na Feilte in July(details below) and aslo for a series of Workshops in Dochas (the women’s prison in Dublin) in August. We are also planning two exciting workshops with international turors for the Autumn – details to be confirmed before the middle of July. 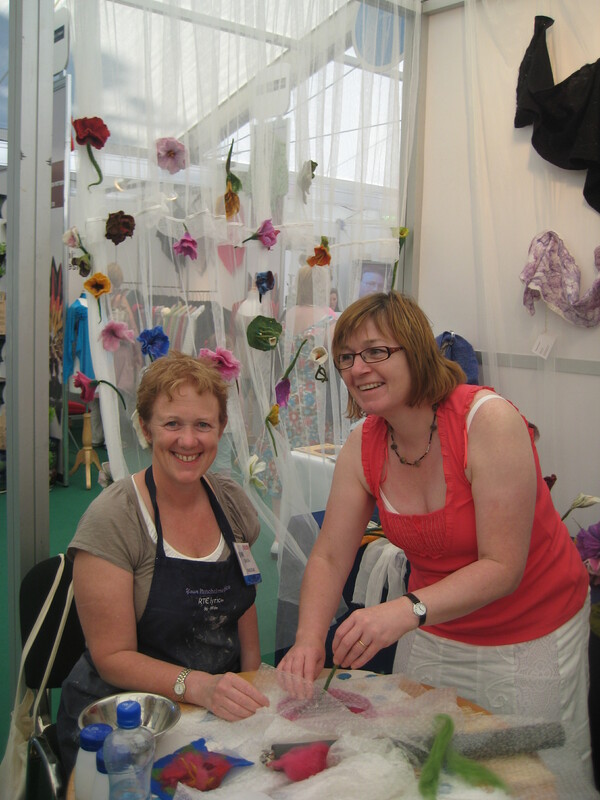 Quite a few members of Feltmakers Ireland entered felt pieces to the RDS National Craft Competition so we will be anxiously waiting to see the results. Wow – what a week-end! The sunshine and smiles all around were a great help to all the hard working volunteers who looked after our colourful stand at Bloom this year. 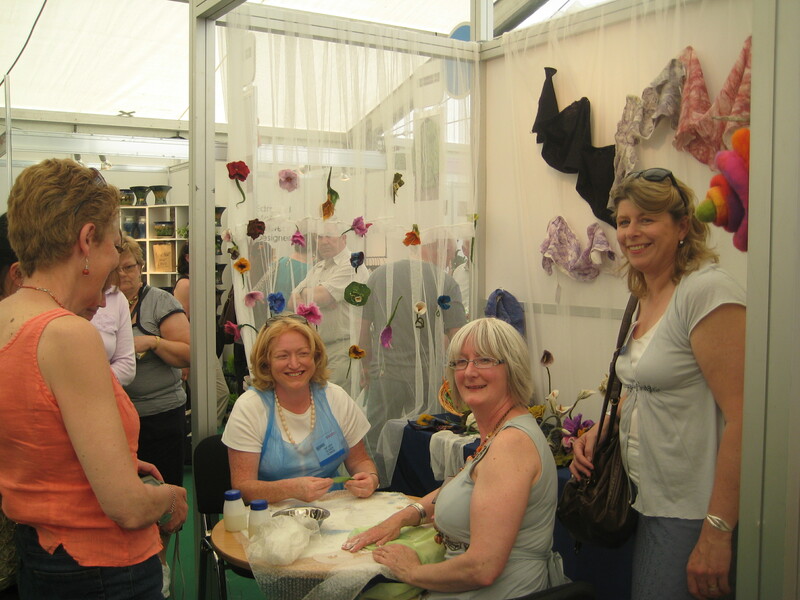 Over 55,000 people attended the event and most of them came into the craft tent to get out of the heat – or so it seemed. The Crafts Council, once again, did a great job bringing together a wide selection of craftspeople to demonstrate their skills – as well as ourselves there were Patchworkers, Ceramics, Woodturners, Weavers & Spinners, Stone Carvers and Calligraphers. There were also retail crafts stands and outside there was a craft area with Basketweaving and workshops in various crafts. It was hard work and felt like a fortnight rather than a week-end but it was thoroughly enjoyable. Looking forward to next year. Members of Feltmakers Ireland took part in a fundraising event in Kilmainham to support efforts to raise money for Crumlin Children’s Hospital. We had a stand with a display of felt items and demonstrations of feltmaking on Sunday 24th May in the Hilton Hotel in Kilmainham and despite it being a fabulous sunny day there were lots of people curious about what we were up to and interested in seeing how felt is made. Well done to Eleanor, Susan, Sheila, Gina and Elizabeth Barry .